At KillBiller we’re all about consumer transparency, and hate to see people getting caught out by surprises in their bill. 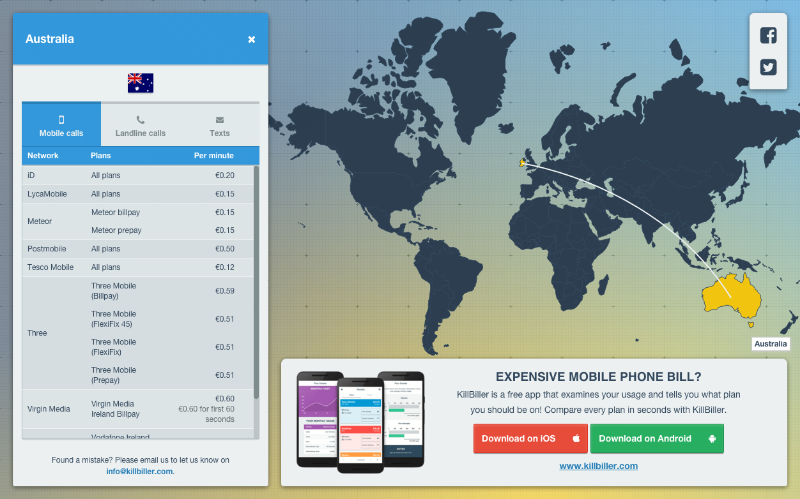 With this in mind, we built a definitive and free tool that allows you to check the costs of calls and texts to mobiles and landlines worldwide. worldcallcosts.com is as simple as it gets. All you have to do is enter the country you wish to call in the box, or click the country on the map and our algorithm does the work for you. No more trawling through lists, we give you what you need to know, instantly. International rates can vary massively. For example, our research has shown that the cheapest mobile rate to Brazil is over 20 times cheaper than the most expensive rate. Our new free tool will allow you to easily and quickly check whether you’re overpaying on international costs. What can I do to save on international calls? If you plan on making international calls, customers are advised to take up any network offers, special packages, or bundles. While sometimes hidden, networks often offer free opt-in special rates for international calls which can significantly reduce costs. For example, Vodafone’s Standard Prepay Rate to the UK of 30c per minute is reduced to a very competitive 10c per minute when customers ‘opt-in’ via text. Meteor and Lycamobile offer similar value rates when customers choose to opt-in via text. These offers aren’t often widely publicized but could save the right users big on their phone bills. The most common countries dialled from Irish mobiles are the UK, USA, Poland and Australia. The UK, Poland and Australia can all be as cheap as €0.01 per minute to call landlines, and the USA can be as cheap as €0.02 per minute to call landlines or mobiles. It's worth checking the best rates with our tool in order to save money. Let us know if you like the site! We’ve already gotten great use out of the tool for helping us to calculate rates for calling friends and relatives in the US and Australia and we’re looking forward to seeing how you get on with it. Send a mail to info@killbiller.com if you have any questions or comments for us. We’re always looking to improve our products, and love to get feedback!